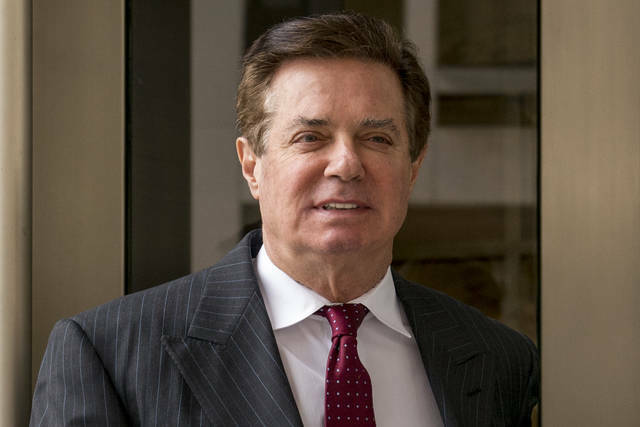 WASHINGTON (AP) — Lawyers for Paul Manafort, President Donald Trump’s former campaign chairman, asked a federal judge Friday to relocate a criminal trial starting later this month because of pretrial publicity. The financial crimes trial of Manafort is scheduled to start July 25 in Alexandria, Virginia, just outside Washington. But his lawyers argued in court papers Friday that it would be impossible for Manafort to receive a fair trial because of the intense media coverage surrounding his case and special counsel Robert Mueller’s investigation. They asked for the trial to be relocated to the more sparsely populated city of Roanoke in southwest Virginia. A Google search for news articles about “Russian collusion” turned up 2,900,000 results, and thousands of articles have been focused on Manafort. “Reviewing these articles, one is hard pressed to find any that are not unfavorable to Mr. Manafort,” the defense lawyers say. In addition, they say, voters in the Virginia region where jurors would be drawn from voted 2-1 in favor of Democratic presidential candidate Hillary Clinton, Trump’s opponent, while “this split is more balanced” in Roanoke. He faces charges related to his work for pro-Russia Ukrainian political interests. The charges don’t relate to the core focus of the Mueller investigation — potential coordination between the Trump campaign and Russia — and prosecutors said in a court filing that they do not intend to raise allegations of collusion. But they do say they plan to present evidence that a bank executive who approved a loan to Manafort expressed interest in working on the Trump campaign, told Manafort about that interest and eventually secured a position advising the Trump campaign. Manafort was jailed last month after a federal judge revoked his house arrest over allegations of witness tampering in Mueller’s investigation. Defense lawyers said in court papers Thursday that Manafort is locked in a jail cell in Virginia for 23 hours a day, excluding visits from his attorneys, and has been in solitary confinement because the facility can’t guarantee his safety. The lawyers are asking a federal appeals court to overturn the judge’s order and release him under certain conditions as he awaits trial. The lawyers said his detention makes it “effectively impossible” for Manafort to prepare for trial. They said the judge, Amy Berman Jackson, did not analyze carefully enough whether Manafort had actually committed witness tampering. “Independently, the alleged evidence of obstruction is so thin that it cannot reasonably support the determination that no set of conditions could ensure Mr. Manafort’s appearance and the safety of the community,” Thursday’s court filing states. Manafort is one of four Trump campaign or White House aides to have been charged in Mueller’s investigation. Three others — George Papadopoulos, Michael Flynn and Rick Gates — have pleaded guilty and agreed to cooperate with investigators. HILO, Hawaii (AP) — Hawaii officials aim to open a primary election day polling place in the Big Island district hit hardest by Kilauea volcano’s months-long eruption. Chief Election Officer Scott Nago told the Hawaii Tribune-Herald his office was in the process of establishing the spot in Pahoa town for the Aug. 11 primary. Last month, after the eruption destroyed hundreds of homes, Nago said voters in two precincts would only be able to vote by absentee ballot. He said there would be no in-person voting on the day of the election for these two precincts in the Puna district. But that move came under criticism from U.S. Rep. Colleen Hanabusa, a candidate for governor, local lawmakers and the American Civil Liberties Union of Hawaii. Nago said Thursday he said the eruption has changed, enabling the state to adjust plans. “We’re in contact with Civil Defense, we understand the situation has stabilized,” Nago said Thursday. The polling place would be a joint location for the two precincts. Nago said a location hadn’t been selected yet but he was “pretty confident” it would happen. Voters in the precincts — which include Leilani Estates and Kapoho among other neighborhoods — will still be able to cast their ballots during early walk-in voting at Pahoa Community Center from July 30 to Aug. 9. Nago said efforts to open a polling place on primary election day weren’t in response to the letter. Nago also said that announcing early on that voting in the two precincts would be done by absentee mail only was the right call at the time. Hawaii County elections administrator Pat Nakamoto said ballots to the 6,070 affected voters were mailed last week and 48 had been returned by Thursday. Absentee mail ballots for other precincts will be mailed July 17. Nakamoto said voters may still use walk-in voting sites if they were mailed an absentee ballot. Voters can use any early walk-in site around the county but must use their designated polling place on primary election day. DELAWARE, Ohio – Ohio Wesleyan University today (July 9) announced the appointment of Stefanie Niles as its vice president for enrollment and communications. In her new role, Niles will oversee the offices of admission, financial aid, and communications and work closely with prospective students and families to help them successfully navigate the college-enrollment process. Most recently, Niles served as the vice president for enrollment, marketing, and communications at Dickinson College in Carlisle, Pennsylvania. At Dickinson, she oversaw 118 employees and was responsible for the admission, financial aid, marketing and communications, institutional research, and athletics departments. She served as a member of the president’s senior staff and co-chaired the college’s Strategic Planning Committee. During her tenure at Dickinson, Niles expanded international recruiting and enrolled the most diverse and best academically prepared class in the college’s history in 2017. The college reported its largest applicant pool ever in 2017-2018. A national leader in her field, Niles is the 2018-19 president of the 16,000-member National Association for College Admission Counseling, the leading national organization for college admission professionals. She will join Ohio Wesleyan Aug. 15 and report to President Rock Jones, Ph.D.
Niles joined Dickinson in 2015, following four years with Hollins University in Roanoke, Virginia, where she last served as vice president for enrollment and marketing. Her career began with 12 years of experience at DePauw University in Greencastle, Indiana, where she ultimately served as vice president for admission and financial aid. Niles holds a Bachelor of Arts degree in English from the University of Virginia, a Master of Science in education from Indiana University, and a Doctor of Education in Higher Education Management from the University of Pennsylvania. Founded in 1842, Ohio Wesleyan University is one of the nation’s premier liberal arts universities. Located in Delaware, Ohio, the private university offers more than 90 undergraduate majors and competes in 23 NCAA Division III varsity sports. Through Ohio Wesleyan’s signature OWU Connection program, students integrate knowledge across disciplines, build a diverse and global perspective, and apply their knowledge in real-world settings. Ohio Wesleyan is featured in the book “Colleges That Change Lives” and included in the U.S. News & World Report and Princeton Review “best colleges” lists. Learn more at www.owu.edu. COLUMBUS, Ohio – Following a successful major medical procedure in June for outgoing Executive Director Dr. Dan Ross, the Ohio High School Athletic Association Board of Directors has placed incoming Executive Director Jerry Snodgrass into his new post as leader of the OHSAA earlier than planned. Facebook CEO Sheryl Sandberg will participate along with numerous business leaders, politicians, celebrities and national and local community leaders, as well as Marc Morial, the CEO and President of the National Urban League. Thousands are expected in Columbus as are in attendance each year. The conference is one of the largest gatherings of thought leaders in business, politics, entertainment and community engagement in the US, where attendees and participants discuss needed change, bring services and resources to the conference host city, and where they plan to implement solutions for changes that are needed in cities, across the country. 2018 National Urban League Conference will take place in Columbus, Ohio, from August 1st to August 4th, 2018. Facebook CEO Sheryl Sandberg will participate along with numerous business leaders, politicians, celebrities and national and local community leaders, as well as Marc Morial, the CEO and President of the National Urban League. Thousands are expected in Columbus as are in attendance each year. Rousing welcome and conference kick-off address to attendees, sponsors and Columbus residents from Marc Morial, National Urban League President and CEO; National and Local leaders in business, entertainment and community and civic engagement on hand. Tarana Burke, Founder, #MeToo Movement; April Reign, Senior Creator, #OscarsSoWhite; Tamika D. Mallory, National Co-Chair for the Women’s March; Patrisse Cullors, Co-Founder, Black Lives Matter. Panel members form 4 cities will share best practices for investing in strategies, to achieve inclusive growth and innovation, so cities can lead the way as models of urban inclusive economic development. For as long as there has been a tech industry, black people have made significant contributions. We are not just buyers; we’re also inventors! However, statistics reveal a very discouraging fact, which is minorities are depreciated in tech. This session will discuss why there is such a wide racial disparity gap in the tech profession and ways in which we can fix it.